Love, Lenore: photo diary: spring break. My mom recently came up to visit me at school and we painted pottery during her trip. She painted this adorable butterfly garden stone and I painted this vase, which I'm so excited to display! As you can tell, I'm obsessed with coral (although the dress on the far right is red and white)! I recently snagged these cuties from Forever 21 at amazing prices. These will be perfect for work this summer. 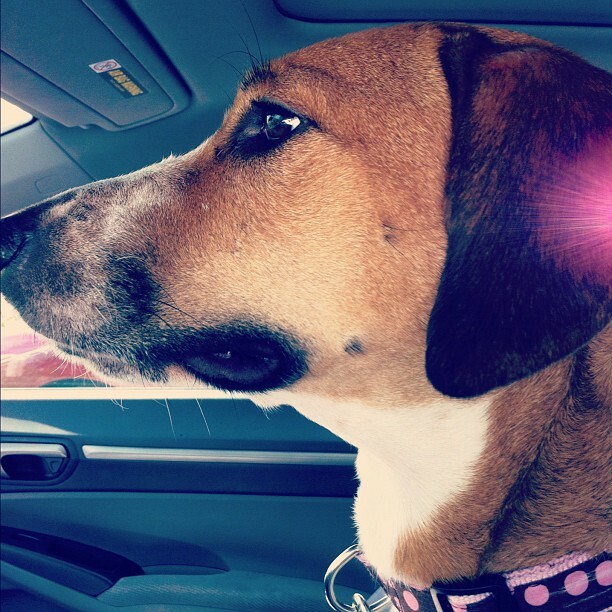 This is my doggie Lulu, a basset hound mix, and I snapped this as we were about to leave for break. This past weekend, Trey, myself, and his younger brother TJ drove to Oklahoma City to go to the Thunder game. It was my first NBA game and I loved it. Here I'm wearing a simple tank and cardigan from Forever 21, and a cool turquoise feather necklace from Aldo Shoes. Thanks for looking and reading ~ have a lovely week everyone! Beautiful pics! You did a great job with that vase! Love the first picture and those dresses too. I'm obsessed with coral too but I always am this time of year. great blog, so glad I came across it :) following! thank you! I love walking to class, both for the exercise and the classes! where did you just graduate from?? thanks! I just looked at yours and it's so great!! is there any way to follow or comment...I'm bad at technology sometimes and couldn't find it ;) but I hope there is because I loved it!